Is your company struggling to define its identity? Do your customers prefer to do business with your competitors? Have you evolved to the degree that you need new messaging to describe your business offering? If the answer to any of these is yes, you might need a new tagline. A tagline is a short phrase or slogan, typically seven words or less, and situated under or alongside your logo, which communicates a single but powerful brand promise that resonates strongly with your intended audience. Why does your company need a tagline? Taglines are one of the easiest, clearest, and most cost-effective ways to communicate a brand. A well-crafted tagline has the power to define your business, support your value proposition, and help differentiate you from your competition. Once crafted, a tagline is designed for long-term use. Taglines typically accompany a corporate name or product line, but can also be used to drive marketing campaigns or as “internal” rallying cries for employees, partners or distributors. The number one rule to remember? A tagline should always be unique to you. Because it so aptly describes your business, no one else should be able to use it. Once you have a tagline you like, you’ll want to protect it by filing for a trademark or service mark. A tagline is not a headline. A tagline is not a mission statement. A mission statement is a written declaration of your organization’s core purpose, focus, and goals. In a paragraph or two, it defines who you are and why you exist, your primary customers, and identifies the products and services you produce. It’s meant for internal purposes—and typically is not shared with the general public. 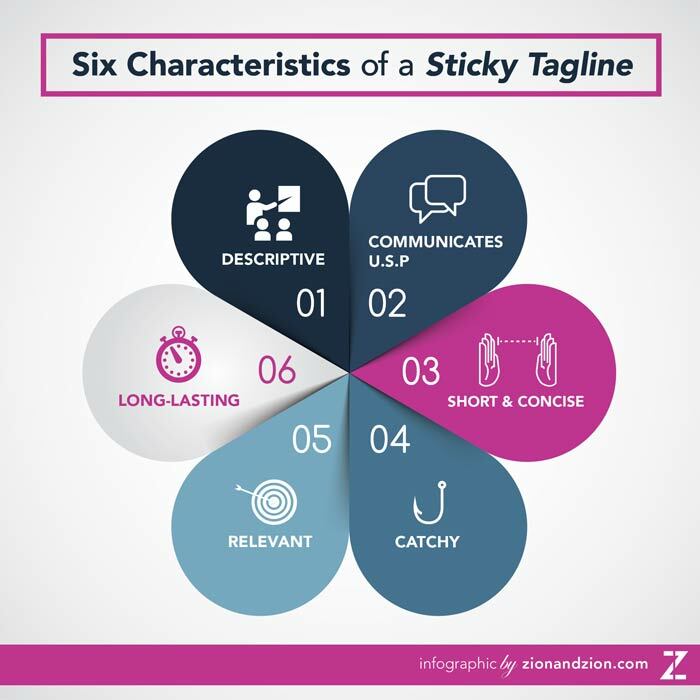 Six characteristics of a “sticky” tagline. It describes your company’s function or character, expresses a need or wish, or aligns with a category. What makes you different from or better than your competitors? Why is your business unique in the marketplace? Taglines are meant to make a mental impact and be easily remembered. That means they must be short—no more than seven words is the general rule of thumb. Taglines are more memorable when they use mnemonic devices like rhyme, alliteration, and parallel construction to get your message into the mind automatically…are inherently clever…or convey a thought in a unique or expressive way. The more closely aligned your tagline is to your company, values, and people, the more authentic it will feel. Trends and fads are the stuff of ad campaign headlines—not taglines. If your tagline embodies an essential truth about your company, it will have staying power. How to get started on your own tagline. First, conduct a mood and personality analysis of your company. Get your team together to brainstorm some descriptive terms. Write down words and emotions that are in line with your company’s image. Don’t ask what your company is, but who it is. Fun and lively? Formal? Confident? Second, analyze your U.S.P. What do you offer customers? What benefits do they get from working with you? What do you do better than your competitors? Third, take a look at testimonials from former clients and customers. Write down short, catchy phrases they’ve provided and see if you can transform them into potential taglines. Some of the best taglines can come from the positive feedback you’ve received. Fourth, combine the features, benefits, and emotions you’ve identified. If you’ve described your brand as casual and friendly, eliminate the other serious and stuffy-sounding words from your options. This will ensure your tagline is in sync with the tone you want to convey. Finally, get feedback from friends, family, clients, and customers. You could even run a poll on Facebook or LinkedIn. While you can and should be the final say in the matter, getting feedback can give you an idea of what’s resonating with others. Creating a memorable tagline is no simple task. It’s a process that requires a little thought—and a lot of creativity. Once you’ve got a good one (think Disneyland’s “The happiest place on earth”), it’ll strengthen your brand and your business.